Grubgang on tour - Alcatraz - somewhere to escape to? 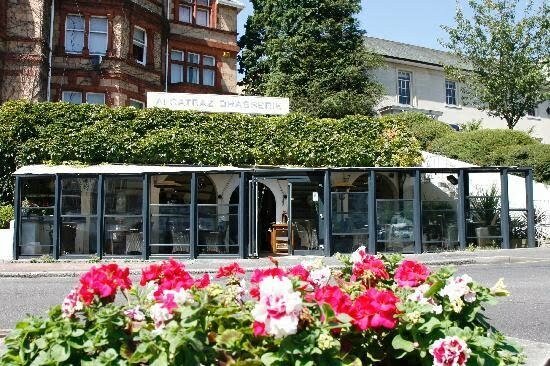 Bournemouth is full of places to eat, and offers a wide range of choices covering many cultures. Just walking around the town, Clair and Dean (who were lost and a little hungry) stumbled across this little gem on the outskirts of the town centre. Not in the most scenic of places, shining out like a diamond in the rough, they offered a lunchtime special menu Grubgangers cant resist... 2 courses for £9.95! There were 3 starters and 3 mains to choose from, but the lure for both members had to be the garlic mushrooms to start(delicious and juicy with great garlic dip) followed by chicken in a creamy tomato and mushroom sauce, with fries (again lovely!!) We were welcomed in with open arms, which was especially nice as we had a pram with the youngest Grubgang member on board! There was a lovely airy conservatory type area at the front which had plenty of room to place a pram! Indoors was spacious too, and very clean!! I would have to point out that one of the toilets is smaller than the other, with not much room to turn around and to be honest, cleaner toilets have been seen!! However, the food was good, the service friendly and the decor fresh and modern. The location and toilets do let it down a little, but i would recommend trying this restaurant, or maybe one of the other Alcatraz Restaurants in the group.